“Oh wow! 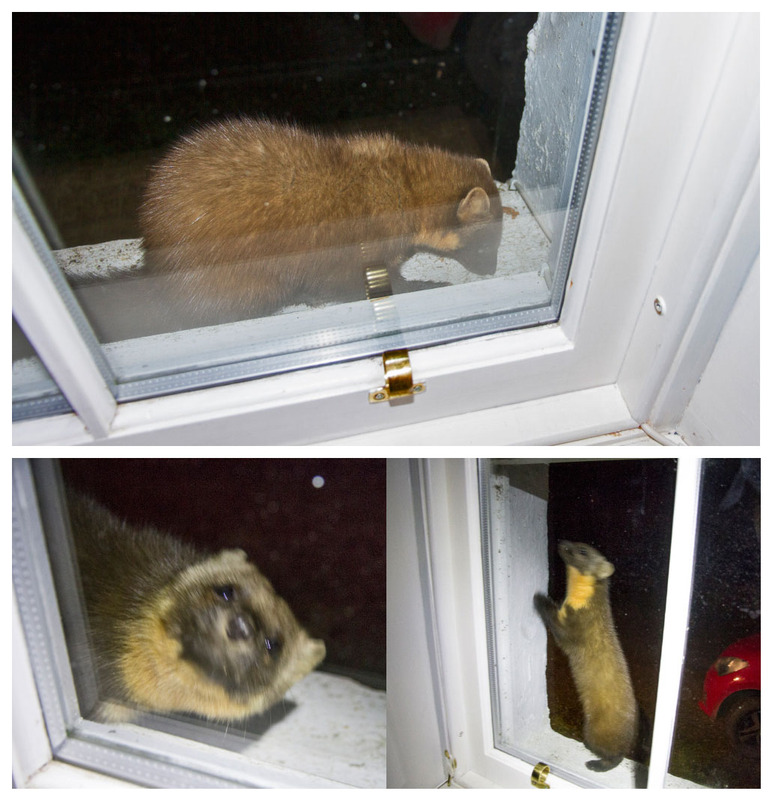 A pine marten visits the cottage” I exclaimed, uber-excitedly, as I turned a page in the cottage guest book. “Really?” replied my sister, not looking up from her book and therefore sounding distinctly underwhelmed. I always made, and indeed still do make a habit of perusing the pages of guest books because it’s like getting secret insider information on the place you’re visiting. In this instance, Kinlochewe in Wester Ross. We were both up there on holiday from the English Midlands and I’d never seen a pine marten before, hence my excitement. “Yeah, it says here that a pine marten comes to visit if you put some peanut butter or jam sandwiches on the bird table”. My sister looked up from her book with a puzzled expression on her face. “Peanut butter and jam sandwiches?” she asked. “Yep, we might need to go and buy some jam from somewhere”. “But won’t it be dark?” she asked. By now the confusion lines on my sister’s scrunched up face were more like canyons. We danced this merry tune for a few more minutes before we finally located the source of the confusion. In my sister’s head the pine martin was the Scottish, forest equivalent of the house martin or the sand martin, both of which are birds. It was a perception in no way helped by this particular pine marten’s chosen dining spot being a bird table, and when we realised that fact the confusion turned to hilarity and we both belly-laughed for ages. It tickles me to this day to imagine what on earth she must have been picturing in her mind’s eye – a small feathered bird with big claws, clambering blind up a bird table in complete darkness, in search of peanut butter & jam sandwiches. Truth be told, even when I told her what a pine marten was I don’t think she could picture it, and come nightfall I think she was as excited as I was at actually seeing one. 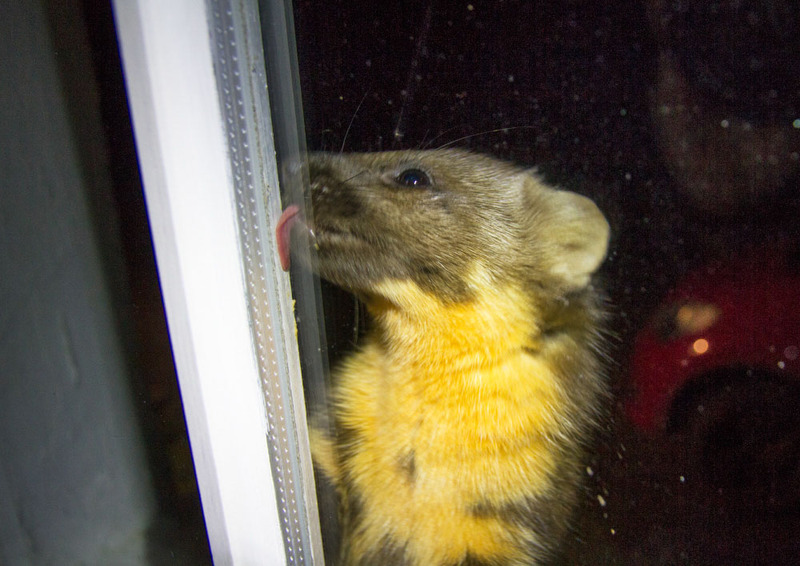 True enough, the pine marten came to visit, dined on its sandwiches and left us both delighted. I tease her about it from time to time but her confusion was understandable really, because the farther south you go, unless you have a passing interest in the natural world you’re unlikely to have ever encountered pine martens in conversation let alone in person, especially in those places where they haven’t been seen for a century or more. So, for the avoidance of doubt, let me introduce you. First up, unlike its avian near-namesakes it’s pine martEn with an ‘EEE’ not pine martIn with an EYE. It belongs to the mustelid (or weasel) family of animals, a group of carnivorous mammals characterised by long sinuous furry bodies, short legs, and scent glands that can be used for communication or, in some species’ case, defence. 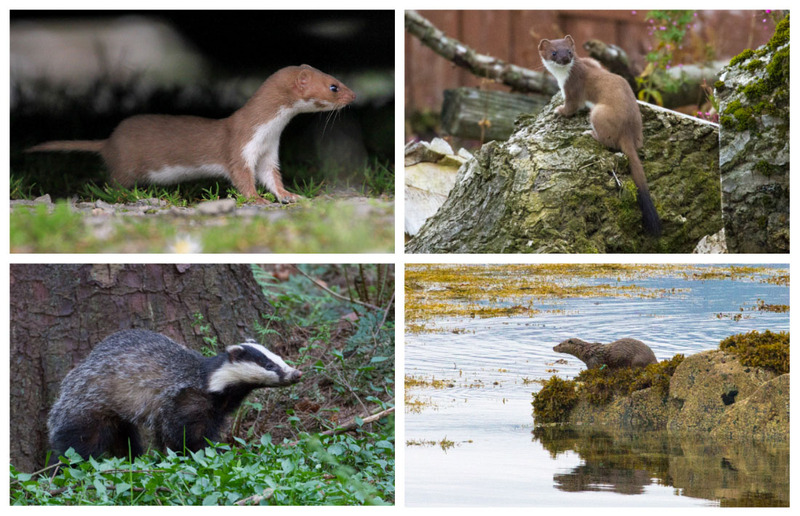 In Scotland our native mustelids include (in order of size) weasels, stoats, polecats, otters and badgers, although these have since been supplemented by escaped or released feral ferrets, and the American mink. The pine marten looks like a big stoat, is about the size of a domestic moggy, has a long bushy tail and its fur is a rich brown, except on its throat where it has a cream or yellow ‘bib’. It spends much of its life up in the trees, aided by long claws that enable it to grip vertical surfaces. It is extremely agile and is able to negotiate a three-dimensional landscape with surprising dexterity for something so large. Food wise it is an opportunistic omnivore, taking pretty much whatever it can and in that sense it is very much the arboreal cousin of the badger. Spotting a pine marten in the wild can be difficult though, as they are mainly nocturnal and elusive in nature. That first encounter of mine in Kinlochewe was in 2002, and in the 15 years since then I have never been lucky enough to see a pine marten properly in the wild i.e. not lured with bait to a cottage window. In fact I only personally know three people who have done so, one of whom was surprised by a strange creature when it crossed the road right in front of her in Killin a few years ago. She snapped this wonderful photo after it climbed over a wall. When she later described the creature to the owners of the B&B she was staying in, they confirmed it as a pine marten and said that in 20 years of living there they had never seen one. The pine marten was once widespread but a combination of habitat loss and persecution took its toll by the early 20th Century, leaving only limited numbers in Wales, a scattering of individuals in England and a remnant population in the northwest highlands. Since that low point the pine marten has been afforded legal protection and, in Scotland at least, where it has been assisted by extensive conifer plantations, it has been expanding its range into its former haunts. By the time of a Scottish survey in 1996, pine martens were found to have ranged south of the Great Glen into the Cairngorms and Perthshire. By 2012 there was evidence of their presence in a Cumbernauld nature reserve, and then last year a pine marten was caught on a camera trap at Hazlehead Park, just three miles from Aberdeen city centre. And of course it’s a source of personal optimism and joy that these secretive creatures have also been seen in my neck of the woods in Fife, having gone extinct there in the 1870s. Not everyone is filled with joy at their return, however, because pine martens are known to prey on the eggs and chicks of game birds, or of protected species like the capercaillie. A study of 20 capercaillie nests in Abernethy Forest in 2009 found that nine of them were predated by pine martens, but other studies concluded that poor summer weather and the relative profusion of blaeberry had a greater impact upon capercaillie breeding success than predation by pine martens. Small mammals seem to be the pine marten’s preferred diet in much of Scotland, but given the capercaillie flirts with extinction at the best of times you can understand the apprehension and see why things aren’t straight forward in Scottish conservation. The Isle of Mull is a case in point – pine martens are believed to have inadvertently stowed away on timber boats in 2004 and colonised an island that they likely never inhabited in the first place. But nobody really knows for certain what the pine martens’ long term impact will be on Mull’s wildlife. But elsewhere on the mainland, predator-prey relationships like the pine marten and capercaillie are normal and the two species should be able to live together, given that these creatures have evolved alongside one another for thousands of years. 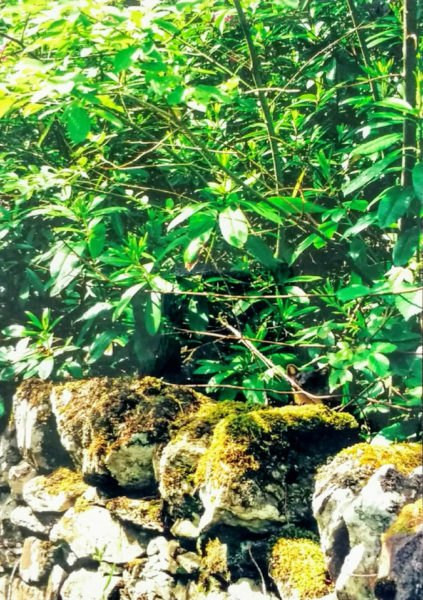 In other parts of Europe and in particular in Scandinavia, whose forests are perhaps most like the ones Scotland once had and indeed should still have, the two species coexist just fine. Doubtless if we had greater forest cover in Scotland, or what little we have left wasn’t split into further fragments thus increasing the miles of forest edges, which in turn makes it easier for other predators like foxes to gain entry into forests, there might be a more natural balance and more stable populations of both predators and prey. If there is a perceived imbalance between martens and birds it’s because of something we humans have done to upset that delicate balance. Pine martens aren’t the problem, we are, but it would also be naïve to think that the Scottish landscape is anything approaching natural, which is why ‘management’ is often mooted where we have upset or destroyed the natural balance of our woodland ecosystems. Illustration of how finely tuned that balance is came via a study of pine martens by Emma Sheehy and Colin Lawton of the National University of Ireland five years ago. They studied the interactions between pine martens and both red and grey squirrels in the Irish Midlands, an area in which the pine marten has recently been resurgent. The results were dramatic. They found that grey squirrel populations had ‘crashed’ where pine martens had moved in, and that red squirrels, which had already suffered population crashes of their own on account of competition with the grey squirrel, had not only recolonised much of their former range as a result but were now living alongside pine martens. Given the chance, pine martens do eat both species of squirrel, but greys are larger and slower than reds, spend more time on the ground, and aren’t as agile in the trees. In short, greys are easy prey for the pine marten, and even those greys that aren’t preyed upon seem to suffer a deterioration in body condition and weight due to the pressure and stresses of living alongside pine martens. As the old saying goes, the enemy of my enemy is my friend, and across the British Isles the pine marten is being lauded as the red squirrel’s unwitting saviour. Understandably, there is genuine excitement in Scotland that similar trends could be seen here, although Emma Sheehy is quick to point out there are subtle differences between Ireland and Scotland. Field voles, for instance, number in the millions and sometimes the hundreds of millions in Scotland, but they are totally absent from Ireland. Might this mean the Scottish pine marten is content with a largely vole-based diet and might eat fewer grey squirrels? It will take more research in a Scottish context to be sure, but thankfully Sheehy and her colleague Xavier Lambin are currently doing just that at the University of Aberdeen, and I believe the results are due shortly. In the mean time there are encouraging signs. 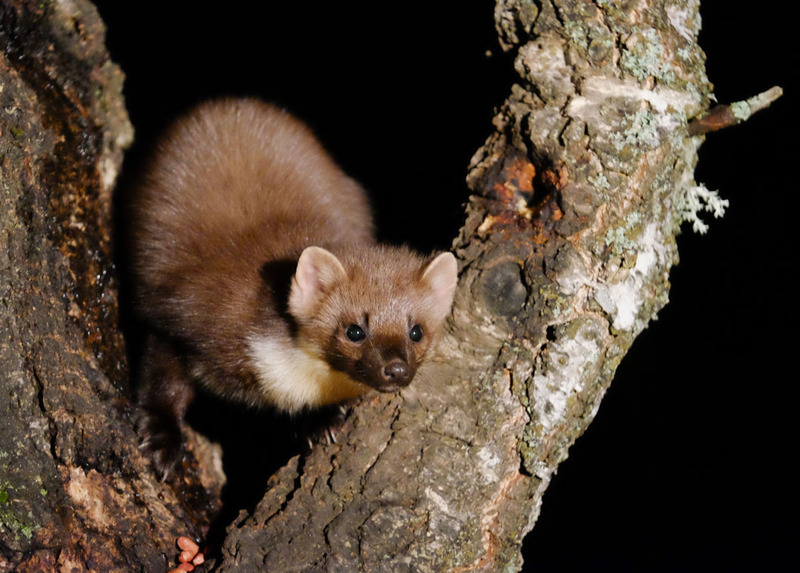 A study of pine martens’ diet in Loch Lomond and Trossachs National Park in 2008 found a similar trend, but it also sounded a cautious note by referring back to an earlier study in Scotland that showed that while pine martens might benefit red squirrels in the short to medium term, a decade or more after pine martens recolonise an area the red squirrel populations decrease. But a smaller, stable red squirrel population alongside a stable pine marten population is surely better than having no pine martens at all, and undoubtedly better than having grey squirrels and ONLY grey squirrels? Ultimately though, in spite of its expanding territory there are probably limitations to how much of Scotland pine martens can recolonise, given the human infrastructure and activity of the Central Belt in particular. Roads, farming, pest control, habitat fragmentation, there are many obstacles that these creatures face. Never the less, in the coming decades it seems likely that they will become both more widespread and numerous in Scotland, and will therefore be seen by an increasing number of people. Until then, your best chance of seeing them is still the highland cottage. And last week, some 15 years after my first live sighting, that is precisely where I got my second. This time in Ardgour, again it was mentioned in the guest book and again I put the peanut butter out to tempt it, only this time I put it on the window sill and was therefore able to sit just inches away from one of our most beautiful and elusive creatures. It was a real treat and privilege for a Central Belter, and I’d like to dare to think that some time in the not too distant future I might even be able to have that experience from the comfort of my own home.